Making authentic shawarma is a lengthy process which involves cooking marinated layers of meat on a vertical rotisserie spit over a grill for several hours. It’s very similar to a gyro but different spices are used. 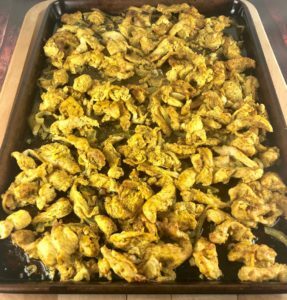 After tasting the deeply marinated chicken in this recipe, your family or guests will find it hard to believe this dish comes together in just a few minutes. To make clean-up simple, everything is mixed together in a zip-lock baggie. I serve this like an open faced sandwich. On a warm piece of naan bread, top with a generous smear of tzatziki, arugula and the chicken shawarma. It’s also delicious served on top of rice or in pita bread and with a side Greek salad. Click the link for my recipe for tzatziki and Greek salad. I serve this like an open faced sandwich. 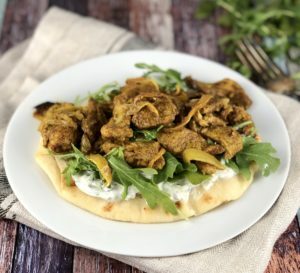 On a warm piece of naan bread, top with a generous smear of tzatziki, arugula and chicken shawarma. It's also delicious served on top of rice or in pita bread. Combine all the ingredients in a gallon sized, zip lock baggie. Squish the ingredients around until well blended. Add the chicken and onion to the baggie and massage the chicken to thoroughly coat each piece. Refrigerate at least 3 hours or overnight. Massage ingredients in baggie several times. Serve over rice, in pita pockets or on naan bread with arugula and tzatziki.